We can’t overstate the severity of President Trump’s buyer's remorse from signing last month's spending bill. Sources who’ve discussed it with Trump say it freaked him out to see the array of usually friendly faces on Fox News’ opinion shows — Pete Hegseth, Laura Ingraham, Tucker Carlson, et al. — ripping into him for signing a bill that spent a ton of money, but gave lots away to liberal priorities and did little for his signature promise to build a wall. 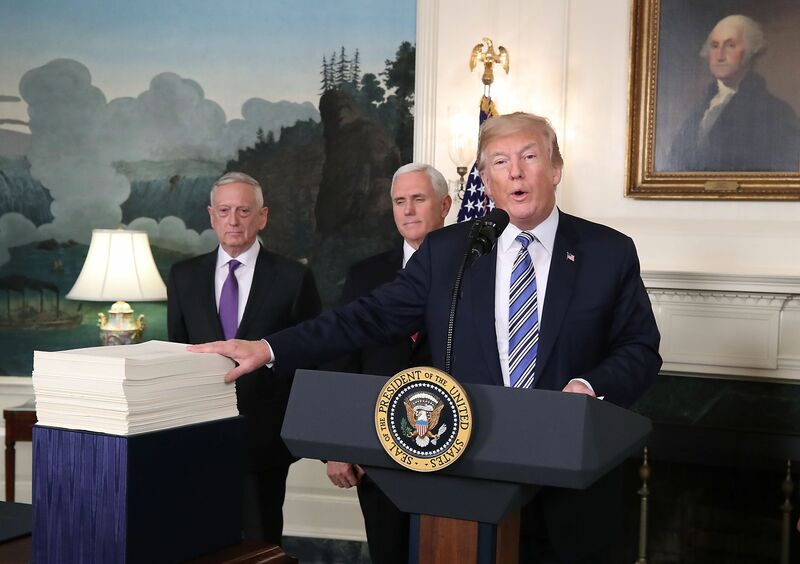 Truth is that Trump had little clue what was in the largest spending bill ever passed. Why this matters: Conventional wisdom on Capitol Hill has been that nothing will happen on immigration after the early failure to cut a deal this year. Republican leadership sources were telling us that the court decision to keep DACA alive took away Trump’s deadline and removed the pressure on Congress to act. But now some of those sources are nervous, realizing that Trump won’t let the issue fade into the background. Trump wants action to toughen immigration laws, and he’s hopping mad that it hasn't happened. He’s grasping at whatever executive tools are available. But watch for him to force action before the end of September, when the government funding expires. A lot could change between now and then. But based on what Trump has been telling confidants, we expect a showdown — and possibly a shutdown — then. Be smart: An election eve fracas that forces Republicans to contemplate a government shutdown vs. harsher immigration laws will motivate some Republican voters. But it could further endanger vulnerable Republican incumbents in swing seats, in a campaign year already stacked against them. Swan tweeted: "@MarkSKrikorian, an immigration hawk of hawks, tells me Jeff Sessions’ order today to US Attorneys is significant. Changes calculus for illegal immigrants trying to re-enter after being deported & having criminal record. Second time would be a felony." "U.S. Trade Rep Bob Lighthizer successfully argued that years of quiet negotiation with Beijing had produced little and now the time had come for a confrontational approach. He’s now in the forefront of negotiations that will determine whether the standoff will develop into a full-blown trade war." "Lighthizer, 70 years old, grew up in the Lake Erie port city of Ashtabula, Ohio, which was battered by imports. ... As with his boss, bluntness is his calling card." "Lighthizer’s role is a change from recent administrations where China experts ... handled the China economic portfolio." P.S. As we told you in Axios PM, Cook Political Report moved 13 House districts toward Democrats. Cook's David Wasserman: "Our latest ratings feature 55 competitive seats (Toss Up or Lean Democratic/Republican), including 50 currently held by Republicans and five held by Democrats." "Tens of millions of Americans have joined protests and rallies in the past two years, their activism often driven by admiration or outrage toward President Trump, according to a Washington Post-Kaiser Family Foundation poll showing a new activism that could affect November elections." "One in five Americans have protested in the streets or participated in political rallies since the beginning of 2016. Of those, 19 percent said they had never before joined a march or a political gathering." "Overwhelmingly, recently motivated activists are critical of Trump. Thirty percent approve of the president, and 70 percent disapprove." Why it matters: "[M]any said they plan to be more involved politically this year, with about one-third saying they intend to volunteer or work for a 2018 congressional campaign." "[T]he agency spent millions of dollars for a 20-member full-time detail that is more than three times the size of his predecessor's." "Pruitt's predecessor, Gina McCarthy, had a security detail that numbered about a half dozen ... She flew coach and was not accompanied by security during her off hours." "[M]ultiple EPA security agents accompanied Pruitt on a family vacation to California that featured a day at Disneyland and a New Year's Day football game where his home state Oklahoma Sooners were playing in the Rose Bowl." "Pruitt was accompanied by nine aides and a security detail during a trip to Italy ... He visited the U.S. Embassy in Rome and took a private tour of the Vatican before briefly attending a meeting of G-7 environmental ministers." Why it matters: "The demands of providing 24-hour coverage ... meant taking some investigators away from field work." "EPA spokesman Jahan Wilcox said ... Pruitt has faced an 'unprecedented' amount of death threats." "A nationwide search of state and federal court records by AP found no case where anyone has been arrested or charged with threatening Pruitt." "EPA's press office did not respond Friday to provide details of any specific threats or arrests." One career security official was moved after he "questioned Mr. Pruitt’s desire to use flashing lights and sirens in his motorcade." "Pruitt, who often ran late, wanted to use the lights and sirens to expedite local trips in Washington to the airport or to dinner, including at least one trip to Le Diplomate, a trendy French restaurant that he frequented." 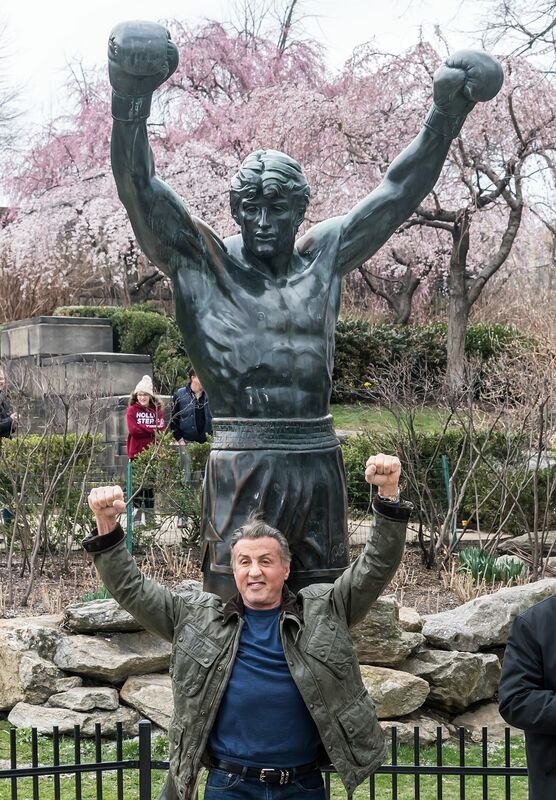 Sylvester Stallone visits "Rocky" statue in Philadelphia yesterday. 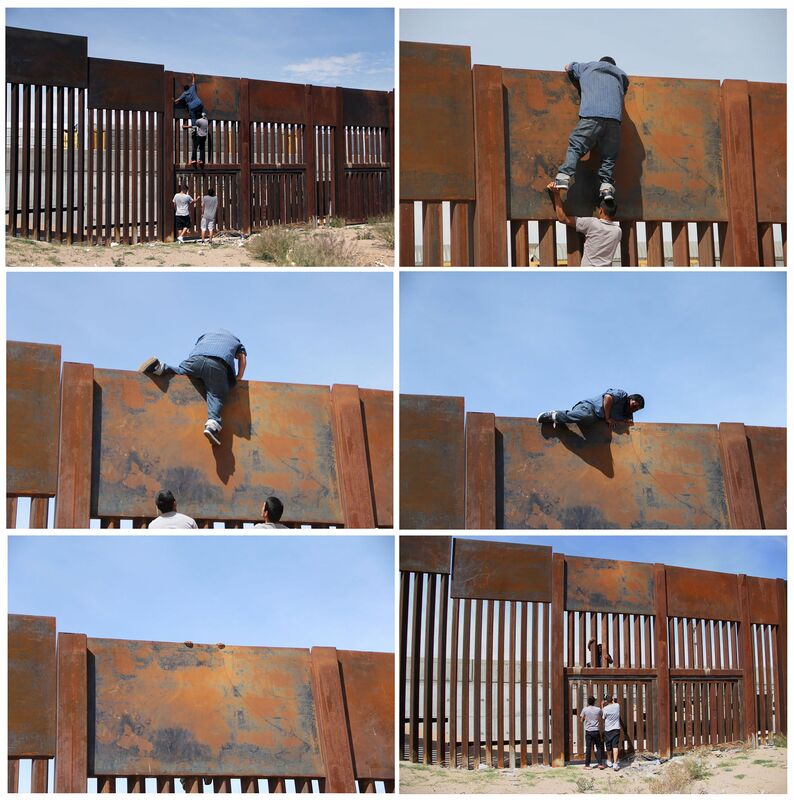 According to Agence France-Presse, these photos taken yesterday show several men helping a border jumper to climb a 20-foot wall to cross to Sunland Park, N.M., from Ciudad Juarez, Mexico. AFP reports: "With the help of three other men — two to give him a boost and one to stand as a lookout — the young man jumped the rusty metal barrier [in] less than two minutes." Sure to become a GOP talking point ... Drudge made the story his banner: "ILLEGAL JUMPS WALL IN MINUTES." "For years, the big brands tried to go healthy as the main strategy to win back consumers who had defected to Greek-style yogurt, protein bars." "That didn’t work. Overall cereal sales in the U.S. have declined 11% over the past five years." "Post recently brought back Oreo Os." "General Mills revived its discontinued artificially colored-and-flavored Trix cereal last year after consumers complained about the dull look and different taste of the all-natural ingredients the company had used as substitutes." "General Mills ... reported that retail sales of its cereal rose 2% in the latest quarter, thanks to Peanut Butter Chocolate Cheerios and Lucky Charms Frosted Flakes." "Kellogg discontinued its lower-sugar Frosted Flakes and came out with chocolate and cinnamon varieties." "After working for years to remove the synthetic dyes in Lucky Charms’ marshmallows, General Mills has abandoned that goal and instead recently came out with a new unicorn-shaped marshmallow." P.S. Is this you? Mintel, a consumer research firm, found that 43% of adults eat cereal as a snack at home.